There's nothing better then sitting outdoors on your deck on a sunny day and enjoying the weather. Deck staining or painting not only makes your deck look great but it protects the natural timber from the harsh New Zealand sunshine which will degrade it over time. The difference between a paint and a stain is that paint sits on-top of the timber and is opaque (you can't see through it). However a good stain will soak into the timber and still allow you to see the natural grain. Whether you stain or paint is up to your preference however some points to bear in mind are that painting on average lasts much longer then staining, about 10 years versus 3-4 years. When it comes to protecting timber painting also confers more protection against the suns harsh rays and moisture then staining. 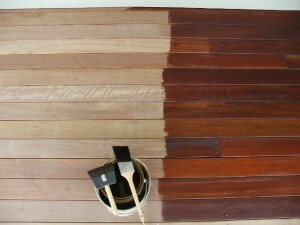 All that being said a good stain will give your deck a more luxurious look then painting. Painting or staining is always an investment and is worth getting right the first time. If you think a qualified colour consultant would be helpful in selecting colours then we'll send you one on request. At Go 1 Day Painting you'll receive a detailed written quote outlining the scope of your project. Our interior painters work from these scopes to ensure your job is finished on time and on budget.